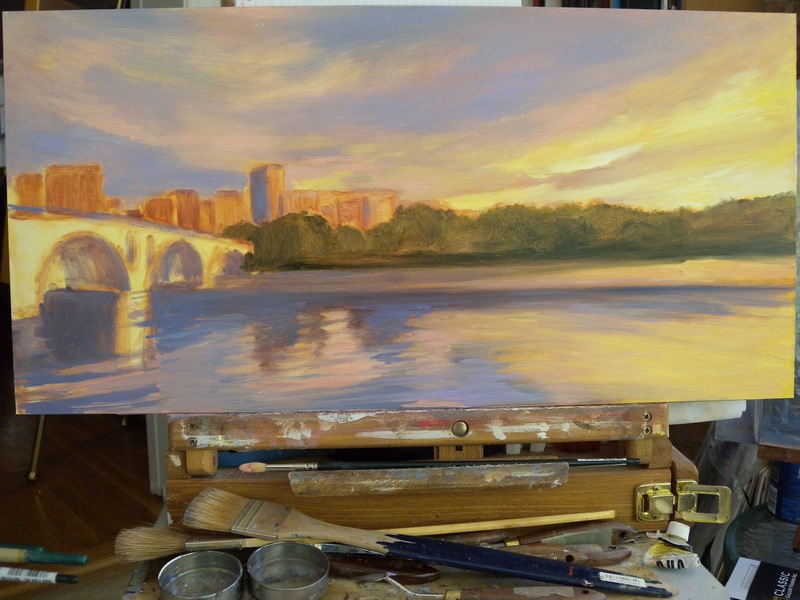 Since this painting was finished in just one more session I didn't have any more "in progress" photos for you. Lately my paintings seem to be coming together more quickly than usual. This one, like the Key Bridge painting, just seemed to flow. I think it has to do with the time of the year and having trees in foliage again. Spring and Fall are my favorite seasons and I am inspired by the stronger colors, particularly in the morning and evening. 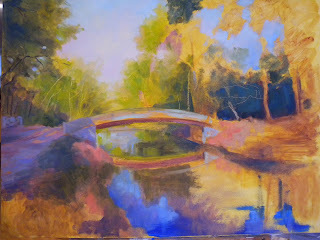 I feel happy when I am working with the palette of colors I have used in these most recent paintings. Golden light and dark shadows seem to be a dominant theme for me right now. That is a good thing as I now have a series of paintings that work well with one another. Looking at this painting I am impressed by how lush the vegetation is for April. As I look out the window it feels more like May and roses that usually don't bloom until then are already in bloom over my back fence. 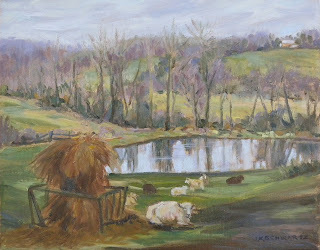 By comparison this small plein air painting I did last April (April 10th 2011) standing in a sheep meadow in Waterford Virginia looks more like late winter. This year has been so mild compared to 2011 and it seems as though we didn't really have a winter. 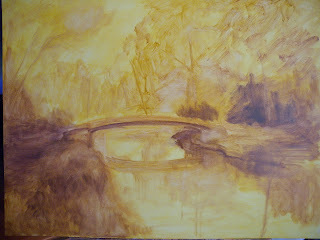 Beginning of "The C&O Canal at the Old Anglers Inn"
Once again I am going to show the progress of a new painting. I have heard from a number of people telling me they appreciate being able to see the process. I feel the same way about the work of other artists. I love seeing the varied approaches and there is always something to learn. Currently this is my preferred way to start a painting. If I can find them and upload them here I will show you the two little 6x8 studies I did of this site last October. 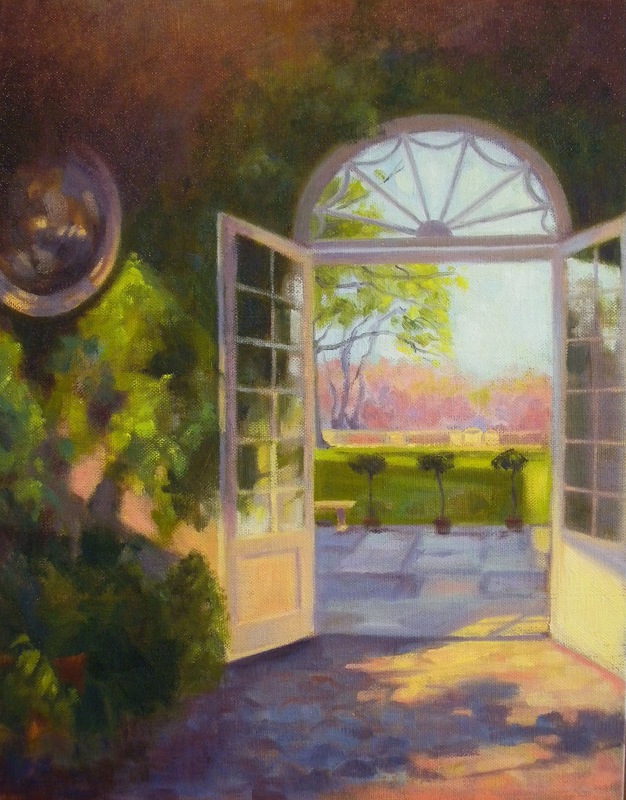 I am basing this painting on them but as I tend to prefer to paint the season I am in I am adjusting it to show the new, lush spring foliage. 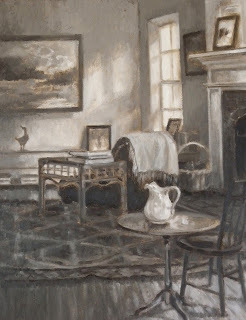 I had some good news from the Art League Gallery telling me that the sepia painting I showed you several posts back "The Artists Sanctuary" sold. That meant I could bring down another painting to take its place and I did so earlier this afternoon. 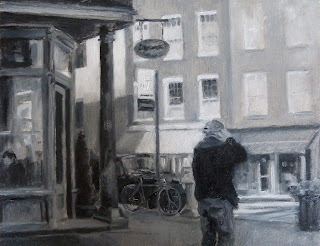 I decided to take down the piece I had in the Salmagundi Club Black and White show back in January titled,"Meet Me in the Village".I wanted to be sure to bring it down on the weekend because this wonderful weather has brought out many visitors to Old Town. 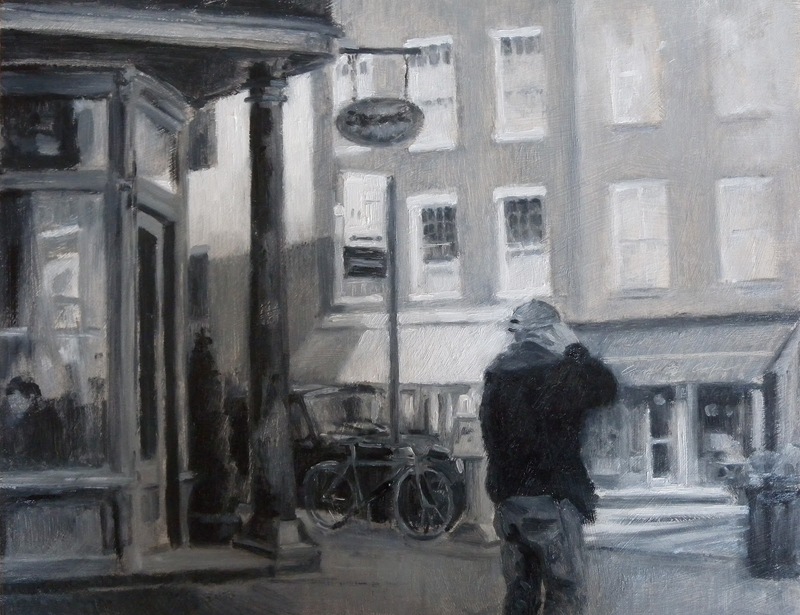 It was a good thought because a short while ago I received a call telling me that the painting had just sold. So...I am thinking I will take this one down later this week as the new replacement. Our gallery director, Rose, said she was feeling good karma and I am inclined to agree with her! I hope the streak lasts, I could use it. I just started this little painting this afternoon. It is the view from the Orangerie at Dumbarton Oaks in Washington DC. 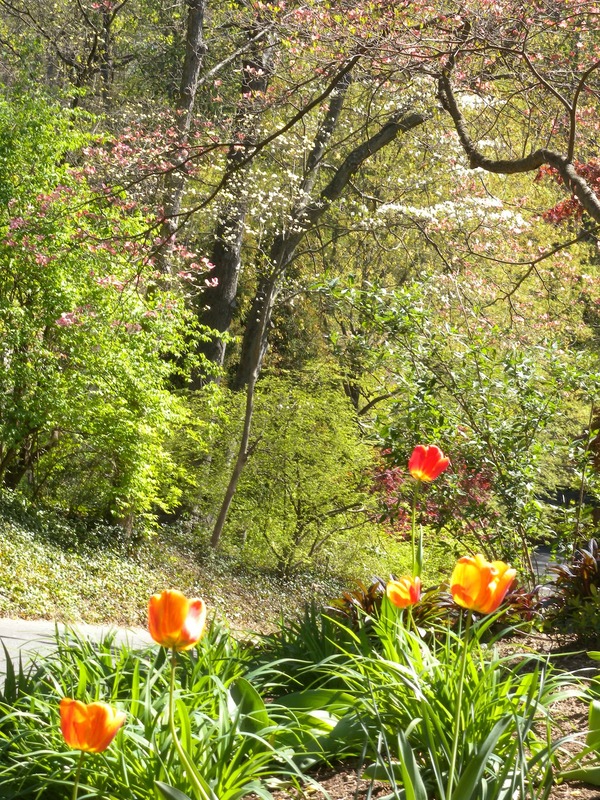 Dumbarton is my favorite garden here in DC and it is considered one of the great gardens in the world. It was created by Beatrix Jones Farrand in the 1920's. When I was studying Landscape Design at George Washington University I spent a lot of time here and as an artist I am drawn to it. 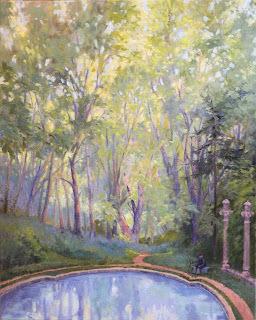 I showed you the painting I did of the Lover's Pool at Dumbarton in one of my posts last month. I have been trying for some while now to get permission to paint on site but so far no luck. The garden does not open to the public until 2:00 in the afternoon and I would love to see it in the morning. Needless to say I have relied on my photos for reference while painting . 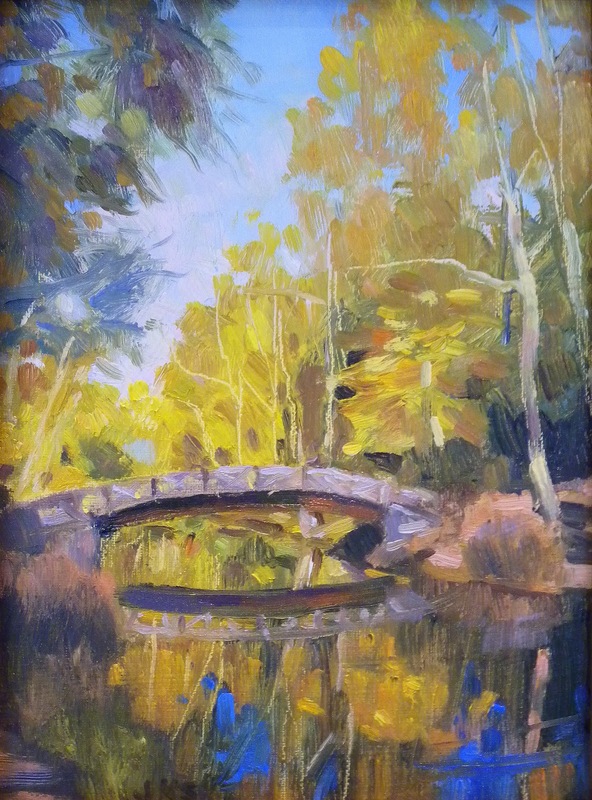 I am using an alla prima plein air approach here as I want that freshness that I would have if I were actually painting there. Still no title for the painting of Key Bridge I showed you in yesterday's post. 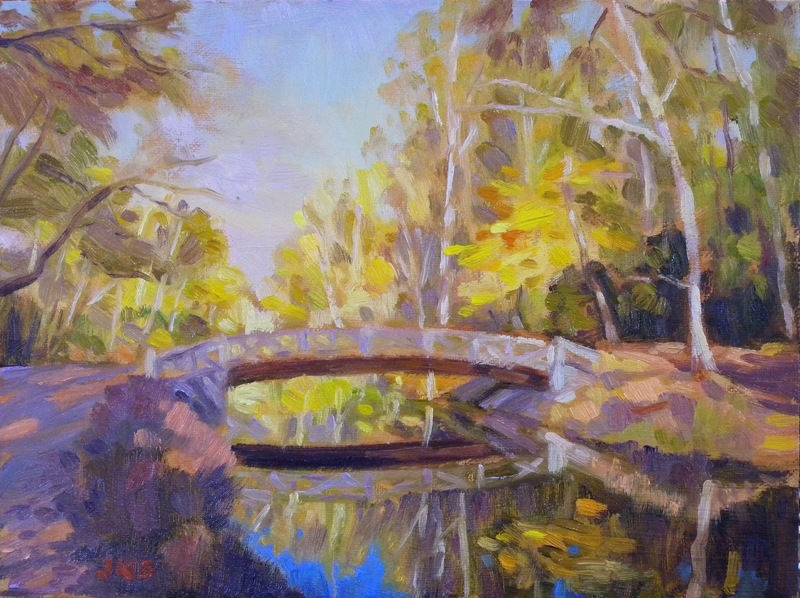 I have a number of paintings of this bridge titled "Key Bridge" at a time of day or season and would like to come up with something different. 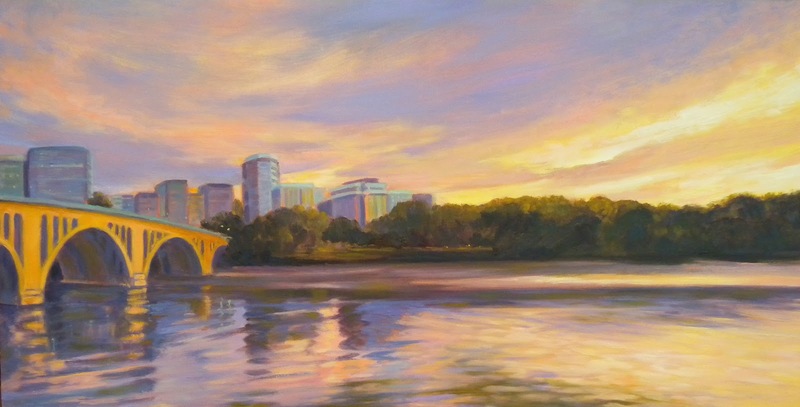 I suppose I could call it "Rosslyn" but somehow the painting needs a title with a little more punch. Last night I said I would tell you about the sculpture competition I competed in during the evening. I was hoping it would be up on the Art League Blog so I could send you there to see the photos and read about it but nothing is up yet. So, I will give you the background. In order to sponsor the April show "Earth", the League of 25 was created which was made up of 25 people contributing $100 each as sponsors. I became a League member. All League members were invited to participate in a team sculpture competition the night of the opening reception. Dutifully I showed up. I had no idea I would have so much fun! The junk that was collected for us to work with was wonderful. Each team had 5 minutes to come up with a concept and plan the attack then each member had 3 minutes relay style to add to the sculpture. Everyone went twice. Glue guns and a large, amused audience were provided. My team chose to create a tower with a forest theme and the plastic and other detrius of man that pollutes it. Somehow this morphed into "Cocktail Hour in the Enchanted Forest":) While not exactly a thing of beauty it was funny and got the point across. The competition was juried and our team won! Yay team! I was touched to find that as winning team members we each received a whimsical little print by deceased Art League artist Nancy Reinke. Nancy's work was always much loved by me and I wish I had gotten to know the artist before she passed away at much too young an age. This photo was taken yesterday with just some very minor things to complete before considering the painting finished. Today I continued the lamposts across the bridge and showed the reflections here and there in the river. I intensified the headlights on the cars driving along the other side of the river and then I signed it. This painting came together easily in spite of the sporadic way I had to work this week. I just wish I could decide on a title. 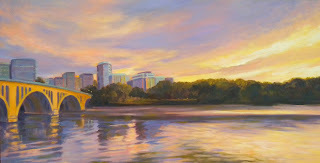 I am on the Washington side of the Potomac watching the setting sun hit the Key Bridge and I am looking across at Rosslyn Virginia. I will ponder this for awhile. 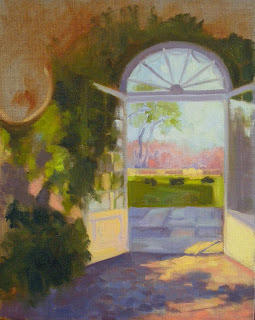 I plan to include the painting in the June show at the Ratner Museum in Bethesda, "Landscapes and Other Visions. This is going to be a very brief post tonight. 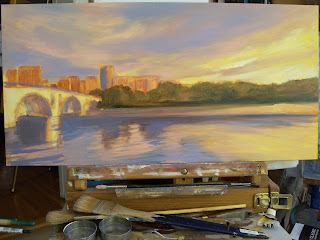 I just wanted to show you where I was on the Key Bridge painting. This is the first painting I have shown you step by step in a while. This work was done yesterday but when I stopped painting the light was too dark for a decent photo. I took this one when I got back to the studio today. It is well on the way and I want to be careful to stop and resist the itch to play with it until I've killed it. 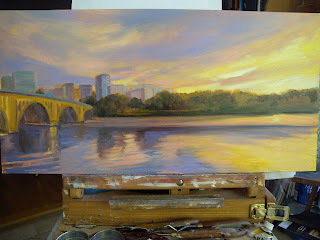 If it turns out OK I might want to include it in the June group show at the Ratner Museum in Bethesda, MD. The show is called "Landscapes and Other Visions" and this painting has a similar feel to other paintings I will be exhibiting. 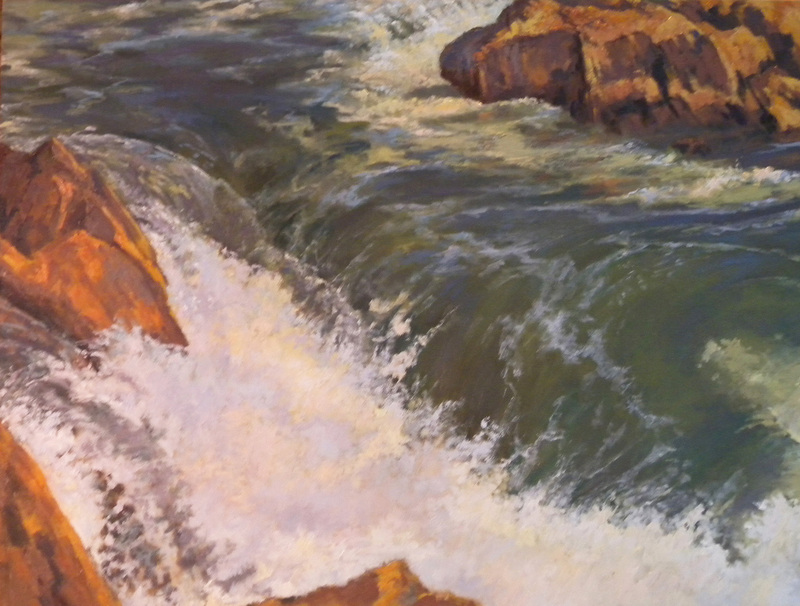 I am pleased to say that "High Water" was juried into the April All Media Show at the Art League Gallery today. This painting was one of a series I did of the Great Falls in Virginia. Last year we had record snows and in March when all that snow started melting in the higher elevations we had a truly spectacular, exciting rush at the Falls. We did have some early flooding but when things settled down a bit the views were exhilirating and inspiring. I still have one or two paintings in mind that I sketched out last March and just haven't gotten around to them. This year the Falls are much quieter so I think my sketches and memory will have to serve as my reference for those works should I choose to paint them. Also on exhibit this month in the Art League Bin Gallery is this small painting "The Artists Sanctuary". It is a sepia painting I sent up to the Salmagundi Club in NYC for the annual Black and White Show (sepia also qualified). It didn't sell so I have it back and put it in this show. It is the interior view from my studio which is separted from this room by a low step and glass pocket doors which I usually keep open. 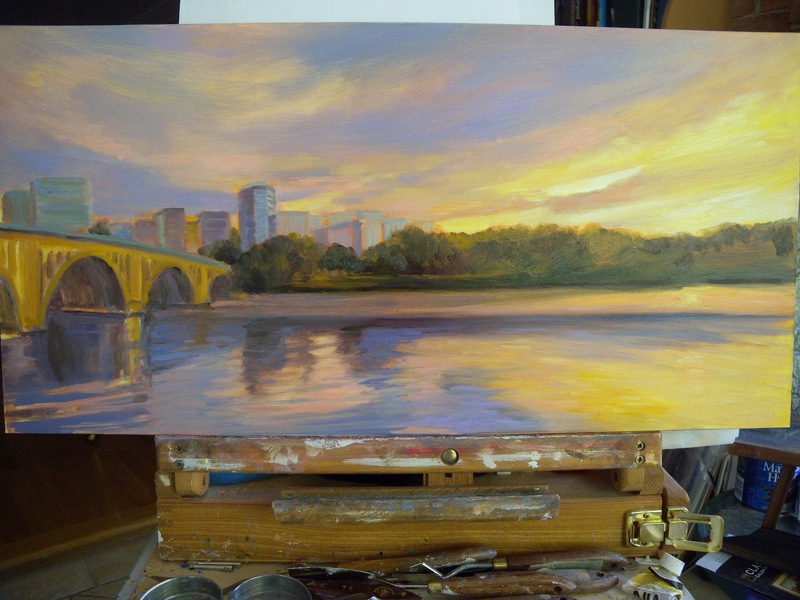 I sat at my small easel and painted this one afternoon this winter. 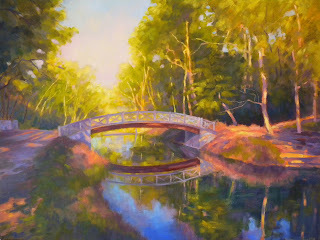 It is a personal painting so if it does not sell at the Art League I think I will just keep this one for myself. 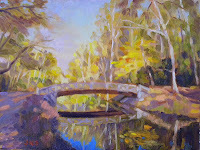 The day reminded me of an April day that I painted in 2010. The painting, which has long since found a new home, is seen here on the left. Dumbarton Oaks in Georgetown has one of the most beautiful gardens in the world and this painting is of the "Lovers Pool" in a corner of the garden. Actually there were more people there. Children were running down the hill and couples strolling down the path but what caught my attention was this old man just sitting there enjoying the weather, the pool and the bluebells that were in bloom there on the hill. Allergies may have prevented me from painting today but not from taking a brief photo shoot around my house. I liked this one of the top of the lane and would like to paint the view down the lane later this week. 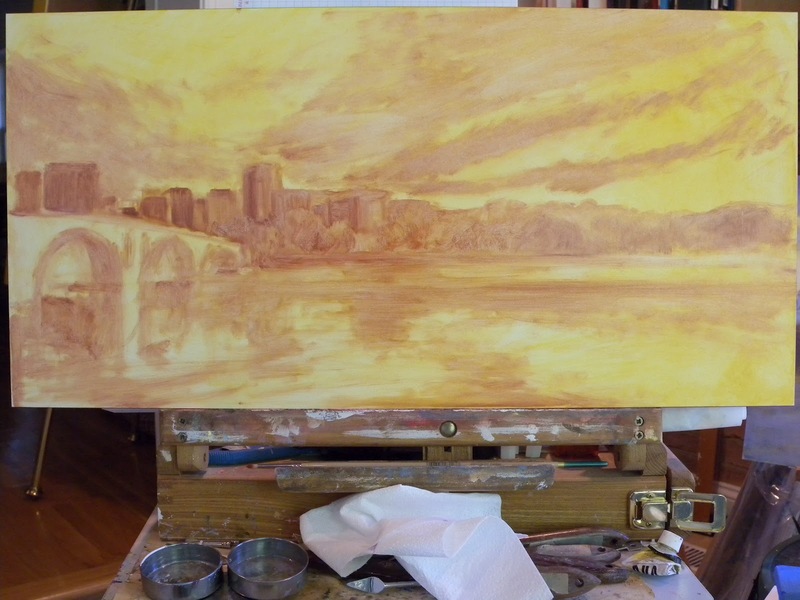 Instead I worked in the studio today and started a new painting of the Key Bridge. I am painting on gessoboard again and used yellow ochre for the underpainting. I blocked in the composition and that was all I managed to do today. I just came home from dropping off some paintings at the Art League and was happy to see that the little plein air painting I showed you in February, "The Torpedo Factory Marina, February" sold this month. That is always good news!